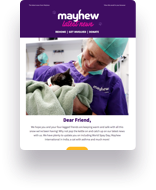 Mayhew International Veterinary Training Programme was established with an aim to promote safe and secure veterinary practices and encourage the advancement of dog and cat welfare abroad. This gift could enable Mayhew International to welcome further students to the UK and to send our veterinary team abroad to provide essential lifesaving veterinary training. The team also deliver educational programmes abroad to help change attitudes and improve the health and welfare of the countless animals left forgotten and living a pitiful existence in many developing countries.